For all of the ney sayers of the "new" BEP, I have this to say to you - since the days of Elephunk, with the exception of "Where Is The Love", all of BEP's songs are mostly party jams. It's arguable that the entire Monkey Business album was nothing but party music (aside for "Don't Lie" and "Gone Going"), and many of the tracks had choruses that were complete gibberish ("Diddle Dum" comes to mind). Therefore, "Boom Boom Pow" is nothing new for this group. So before I cut in to the new material -- here's a word to the remixes featured on the bonus CD. Unless it is a dance based remix, I find the idea of remixing your greatest hits by making it virtually unrecognizable several years later probably isn't the greatest idea unless you're beyond super famous. So I'm not much for "Pump It Harder", "Don't Phunk Around" (except for the lifted Lisa Lisa & the Cult Jam chorus which never gets old) and "Let's Get Re-Started" -- but I do dig "Shut the Phunk Up". I was always quite partial to "Shut Up", despite the fact that it didn't do chart-wise what it should have, and Fergie sounds quite different on this mix. She's channeling her inner 1970's funk disco queen and it works. The one notable track from the Bonus Disc: "Where Ya Wanna Go" is a piano based track that sounds like a blast from the 1980's with that back beat. It'll probably appeal to people who weren't so keen on "Pow", and in my opinion, has single potential (but that probably won't happen, seeing as it was delegated to the Bonus Disc). The rest of the bonus disc is all b-side material that is very repeative and just kind of meh. If I've learned anything from listening to Black Eyed Peas music over the years (and especially with this set) -- they like to experiment with sound and genre. Therefore, will.i.am's comment that a proper album no longer exists but the energy will never die is rather appropriate, and I think I agree. BEP was never one to committ to lengthy choruses with intense lyrics, except in rare cases. They are a party band first and foremost, and want you to move your hips and have fun. The set opens with a lengthy version of "Boom Boom Pow" that includes an album intro -- which I like because very few people do it anymore, and it reminds me of the mid 90's R&B albums that always had them. Whether you love the song or hate it, it has been #1 on the Hot 100 for nine weeks now -- making it BEP's biggest hit, and the biggest hit of 2009 so far ("Round Round" by Flo Rida comes in 2nd with 6 weeks). I'm sure this gibberish will wear off soon, but it still sounds fresh to me...and whenever it comes on, I'm totally guilty as charged for rocking out to it. Even if it doesn't make any sense. Let the beat rock! "Rock That Body" features a sample of Rob Base & DJ E-Z Rock's "It Takes Two", and features very very very auto-tuned and super vocoded chorus vocals by Fergie. This takes the "space age" sound of "Pow" and turns it up to 11. I can see this being a single. In fact, if it doesn't become one, I'll be upset. "I Gotta Feeling" is the group's current single, due out June 16th for radio (the day before my birthday! ), and has an introduction that reminds me of the opening chords to Journey's "Don't Stop Believing" (does it to anyone else?). It was co-produced by David Guetta, and samples his song "Love Is Gone" -- which right there says enough of how good it is. It continues the BEP's new fusion of their old sound with electropop. Fergie does me one proud with her vocal hysteronics in "Missing You" -- making it sound like something straight out of the 80's. However, "Ring-a-Ling" just gets downright annoying with its repeatitive gibberish, video game-sounding back synth and Fergie's vocoded stutter. A dorky part of me really wanted them to sample Eddie Murphy's dancefloor classic "Party All The Time" (My girl wants to...party all the time, party all the time, party all the ti-imeee!) on their song of the same name, but if they did, I don't hear it. Instead, we get a generic party song that is pretty slow for a dance jam. Let down. I'm not really feeling "Out of My Head" either. It's another spotlight song for Fergie, but I find her performance so-so, as it's a song about getting crazy and super-drunk. Meh. "Now Generation" busts out guitar and has a twang to it -- with a statement that we are the "generation now", and now dependant we are to our technology. The lyrics, although at time seem goofy to its references to Facebook and whatnot, are very real. We definitely are the generation that can't wait. "One Tribe" can also be described as a political track, and I'm glad to see BEP putting out material that is reminisent to what was, in my opinion, their best track: "Where Is the Love". The set officially closes out with "Rockin' To the Beat", which again sounds very 80's in a good way. The instrumental is pretty killer, but when the rap does come in almost two minutes in, it doesn't add much. 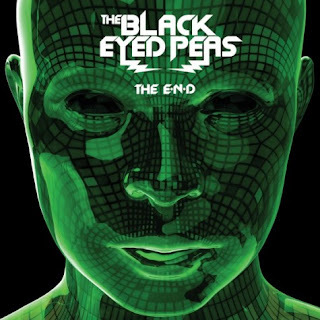 It may not have been Black Eyed Peas' most solid album (that award goes to Elephunk in my eyes -- for material and for an awesome title), but it's alright. It's all listenable (so long as its your cup of tea), and about half of the material is very good. "Meet Me Halfway" absolutely sounds like a solo Fergie track. It's like a sequel to "Glamorous". Overall, I like but don't love the CD, but I at least get where they're coming from.